This is the badge issued to women on war work. 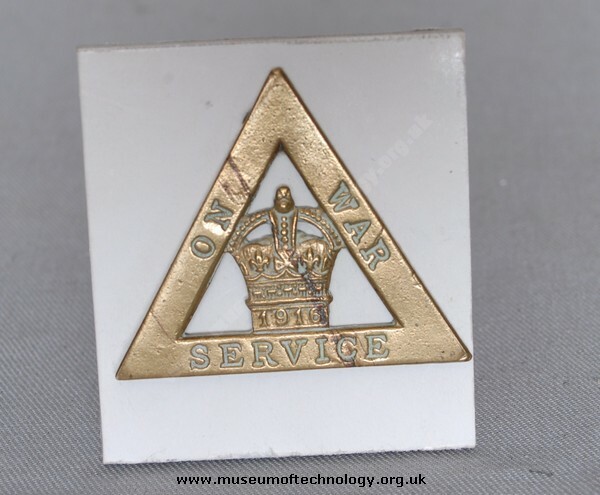 It has a broach pin type fastening and can be seen worn on the chest or lapels of overall coats and as a cap badge on their 'mob cap' style safety headwear. the round mens' badges have a button hole fittings. Women did not need to have a badge to avoid 'white feathers' but it was considered appropriate recognition of their work at the time. Recognition sadly lost when the war ended and many were sacked.